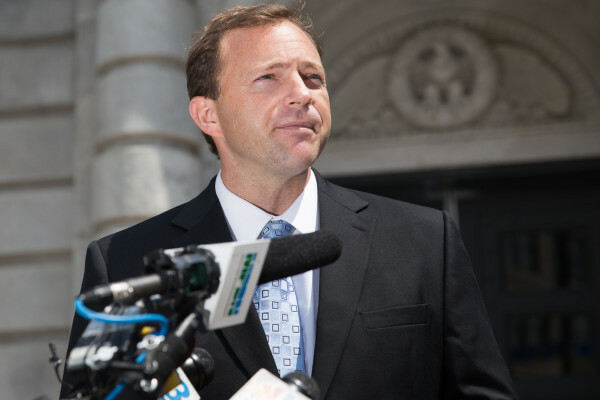 House Speaker Mark Eves addresses reporters during a press conference outside the U.S. District Court in Portland in this July 2015 file photo. Democratic House Speaker Mark Eves has lost his appeal for a District Court to reconsider his civil lawsuit against Gov. Paul LePage. The U.S. Court of Appeals of the First Circuit dismissed Eves’ appeal in a split decision. Two members of the three-judge panel ruled that LePage is protected by the immunity clause designed to discourage civil lawsuits against elected officials. The decision reaffirms a May ruling by U.S. District Judge George Singal to dismiss Eves’ lawsuit. Tuesday’s 34-page ruling includes a dissent by Rogeriee Thompson, who argued that the immunity defense “hardly gives an official carte blanche to trash a citizen’s constitutional rights” because it has been used in previous rulings. Eves’ lawsuit alleged that LePage illegally retaliated against Eves when he threatened to withhold state funding from his future employer, Good Will-Hinckley. The Fairfield nonprofit later rescinded its offer to make Eves its next president. Eves also sought an injunction against LePage to prevent him from threatening the nonprofit again and an order to seek civil rights training.